iPhone X is completely different from other iPhones, it marks the beginning of a new age in smartphones, where display, facial recognition, Animoji and gestures will be used to control everything. But, without a home button it sounds impractical and difficult. Well, it always takes time to adapt to changes, but it’s definitely worth the effort if the change is for the better. To help you get a hold on your new iPhone we have gathered a few hidden tips that’ll help you enjoy your iPhone X. Check these out for a better user experience. Minus the home button, we need to adapt to the new gestures. To close running apps on iPhoneX, swipe up to the center of the screen and open App Switcher. Once it is opened, you will be able to see icons of all running application. To close them, swipe up to close apps one by one as you use to do previously. To close all at once press and hold on any of the icon, you will see a little red close icon at the top of each app tap on it to close the apps. It is taking some time to get used to the screen with the new iPhone X. Some of us find it difficult to navigate to the top of the screen thus missing out on availing one handed access. To bring top part of the screen closer to the bottom, use iOS Reachability feature, which gives easy one-handed access. To enable, go to the Settings > General > Accessibility, and here select Reachability. Once activated, to use Reachability, swipe down on the strip at the bottom that replaces the Home button. With no Home button, there has been some confusion around direct access to Siri and Apple Pay. Apple has moved the accessibility of these services to the physical button on the right side of iPhone X. To enable Siri, long-press the side button and for Apple Pay, double tap the same button in quick succession. Once you do so, iPhone will verify your identity using Face ID and will allow access to these features. Extra tip: To turn off iPhone X, press either of the volume button and side button together. This way you will be able to see the option to slide to power off. Feeling lazy? Don’t want to look into the phone and unlock it? Turn off Face ID by pressing any one of the volume buttons and the side button together. Once it is disabled, the phone will vibrate indicating that Face ID is disabled, and only passcode will work to unlock the phone. However, once you enter the passcode and lock the phone, Face ID will be enabled again. Extra tip: If you keep on holding the volume and side button for a while, the phone with vibrate after which, iPhone X will automatically trigger the emergency SOS feature to call the authorities. Want Face ID to work in a simpler way? This tip will help you. Cautionary note: From security point of view it will make it less effective. To unlock iPhone X using Face ID you need to pay attention to the screen and look directly at your device, with your eyes open. But if want to work out an easy way, you can disable the “paying attention” part. To do so, go to the Settings, head to General and Accessibility, now hit Face ID. Toggle off the option, Attention to make Face ID work faster. Now, with a glance you will be able to unlock your phone. It seems by now you have adjusted yourself to have an iPhone without a home button. But if you still miss it, there is a way to get it back. For this, go to General > Accessibility > AssistiveTouch and toggle it on. This will help you to see a virtual home button that you can use to activate shortcuts. This home button is versatile you can place it anywhere as per your convenience. As the Control Center is moved to the top of the screen, there are two new icons added at the bottom of the lock screen. Using them you can switch on the flashlight and camera. These icons make it a lot easier to use these tools without paying much attention to the phone screen. Also, you can swipe right to left to open the camera. iPhone X has undoubtedly given us new features but some options that were popular before are no longer available directly on the home screen. If you want to check the remaining battery life you need to swipe down from the top right of the screen to open Control Center. Have a problem with your iPhone (which is a rare) and want to force restart it? To reboot iPhone X, first, press and release the volume up button, then press and release the volume down button. Finally, press the right-side button and you will soon see Apple logo. 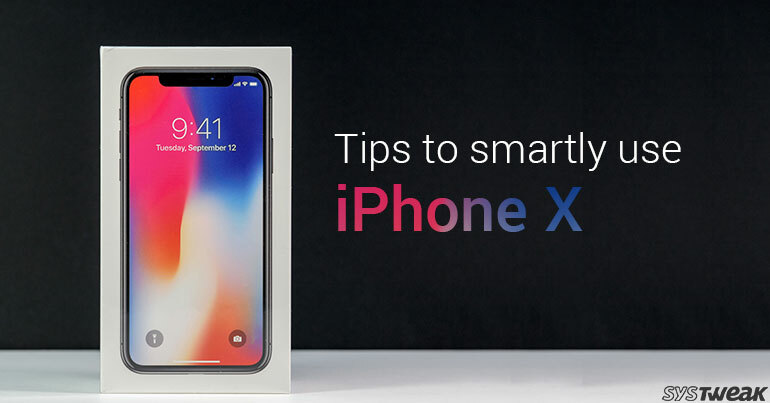 These tips will surely help you get comfortable with your all new iPhone X. We would love it, if you share some valuable tips with us in the comments section below.